WBAP-TV cameramen set up a shot. 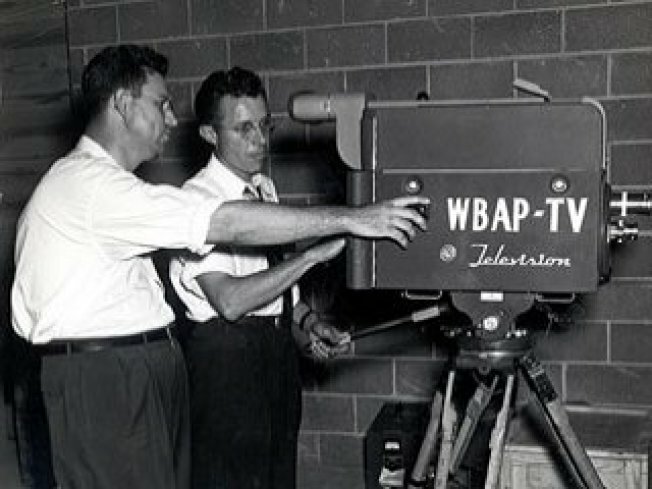 In 1948, Fort Worth, Texas, publisher and businessman, Amon G. Carter, founded television station WBAP-TV. The call letters stood for “We Bring A Program”. WBAP-TV aired its first broadcast on September 27, 1948: the visit of President Harry S. Truman to Fort Worth. The station’s original broadcasts were from the Fort Worth Star-Telegram building in downtown Fort Worth, but in June of 1949, the staff moved into the first television facility in the southwest, the studio location still used today. The Carter family held control of the station until 1974 when LIN Television bought WBAP and changed the call letters to KXAS – a play on “TeXAS”. In 1998, NBC purchased a controlling interest in the station and continues to manage it today. The Fort Worth facility is home to NBC 5, Telemundo 39, Telemundo Production Center, NBC Arthouse, NBC Network News and NBC Universal Television Distribution. The station has a rich history of firsts. Aside from being the first television station in the southwest, it was also the first TV station to broadcast local news in the state; the program was called The Texas News. It was also first to carry a local golf tournament, the first live college and high school football telecasts, first to produce a live weather program and first with helicopter aerial shots. The station was part of an event that changed the world and television. On November 22, 1963, NBC viewers learned that President John F. Kennedy had been shot and killed in Dallas. Then two days later, WBAP-TV captured live images of Jack Ruby as he shot and killed Lee Harvey Oswald, the accussed assasin of the President. It was the first time a murder had been witnessed live on network television in the United States. The Kennedy assassination kicked off a seventy-seven hour live consecutive coverage event. NBC 5’s historically strong position in weather forecasting has its origins with Harold Taft, the first TV meteorologist west of the Mississippi, and one of only three in the U.S., when he signed-on in October 1949. To this day, NBC 5 employs only degreed meteorologists to deliver forecasts, maintaining its tradition of reporting immediate, accurate and reliable weather information.